Stormers captain Siya Kolisi's yellow card was decisive in their 24-12 defeat to the Reds in Brisbane on Friday. With the scores level a 0-0, Kolisi was sent to the sin-bin on the stroke of half-time. The Reds took advantage of their numerical advantage early in the second half and scored two converted tries during Kolisi’s absence. With a scoreline that read 0-0 at half-time, it's hardly surprising that the Reds v Stormers game was not easy on the eye. From a Stormers perspective, they were simply pathetic in their execution - several handling errors were again the order of the day and it's time the players start taking responsibility. It should not be the Super Rugby coach's job to teach his players how to catch and pass a rugby ball. Despite a general lack of efficiency, the Stormers still had a sniff of claiming a late draw when Damian de Allende barged over next to the posts in the 74th minute. It cut the Reds' advantage to nine points (21-12), with an easy conversion to come. However, up-stepped SP Marais to miss another sitter. He did exactly the same against the Blues the previous week and it's simply inexcusable. The Sharks' stunning 42-5 annihilation of the Lions was characterised by a sublime effort from Springbok Curwin Bosch. Bosch, playing fullback, proved a menace for the Lions defence as he set up several of the Sharks tries. He has struggled for starting time in recent weeks but this man-of-the-match performance will surely see coach Robert du Preez keep the talented youngster in his starting XV. According to statistics derived from the match, Bosch made 104m, 11 carries and nine clean breaks! Alarm bells are ringing at Ellis Park after the Lions' capitulation against the Sharks. It's been quite a while since the men from Johannesburg were so thoroughly outplayed at home by a South African team. The Sharks - who themselves have been below par in 2019 - produced their best performance in years and a quick glance at the statistics paints a bleak picture for the Lions. Apart from scoring six tries to one, the visitors bossed the metres carried (645m compared to 322m), ball carries (150-79), defenders beaten (36-16), clean breaks (17-6), passes completed (188-106), offloads (20-6), and rucks won (87-54) categories. Not surprisingly, the Lions conceded 21 turnovers to the Sharks' 12, were forced to make 150 tackles compared to the Sharks' 94, and conceded six more penalties (11-5). These statistics point to complete and utter dominance and it's not the first time this season that the Lions have been made to look rank average. Their fans should be worried. It's fair to say that the Bulls threw away victory in their 22-20 defeat to the Jaguares in Pretoria. The hosts led 20-10 heading into the final minutes before two late tries from Jaguares replacement flyhalf Domingo Miotti stunned the Loftus faithful. 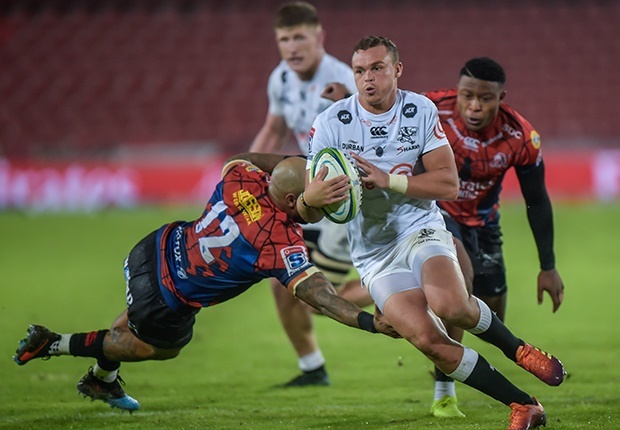 There's no doubt that the two late yellow cards for Tim Agaba and Conraad van Vuuren proved costly but by that time the Bulls should already have secured the victory.